Despite the debilitating slowdown that has taken hold the business of luxury watchmaking, some watchmakers still dream of building incredibility complication and fabulously expensive timepieces. 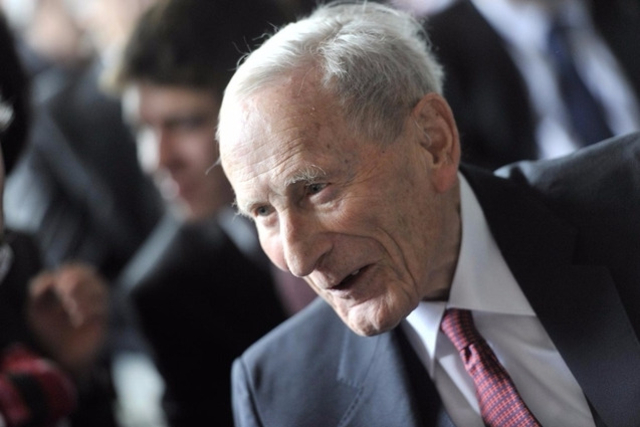 There aren’t many of them today, but Rémi Maillat, founder of Krayon, is certainly one. 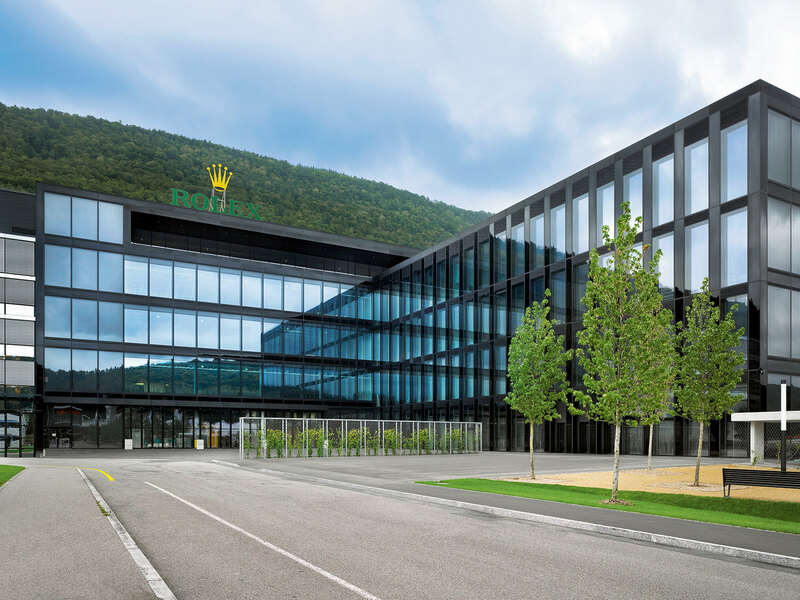 Formerly a movement constructor at movement maker Vaucher and then Cartier where he worked on the jeweller’s complicated calibres, Maillat founded Krayon in 2014 to build complications for other brands. The Everywhere is the first wristwatch built under its own name and it is ambitious. It’s powered by a newly developed movement that shows the date, month and more importantly, the sunrise and sunset times anywhere in the world. 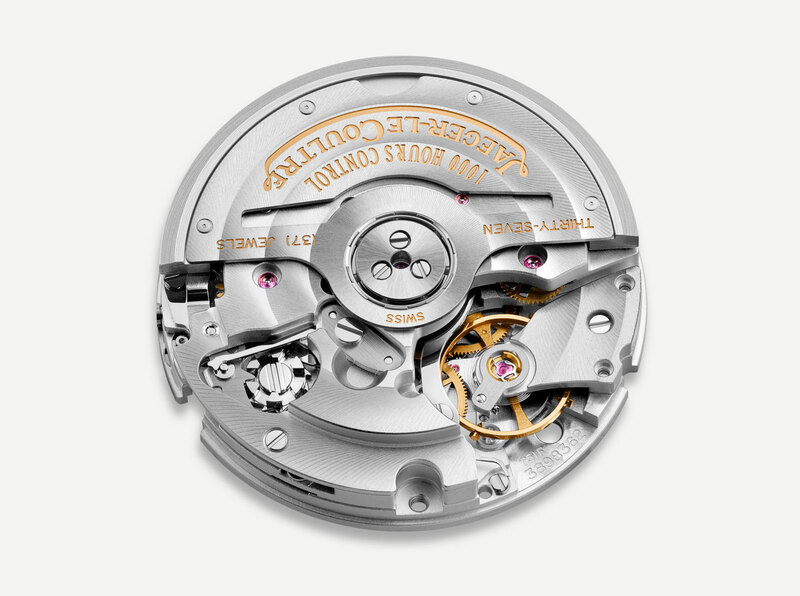 The 595 components that make up the movement make it as complicated as the cal. R TO 27 PS QI inside the Patek Philippe ref. 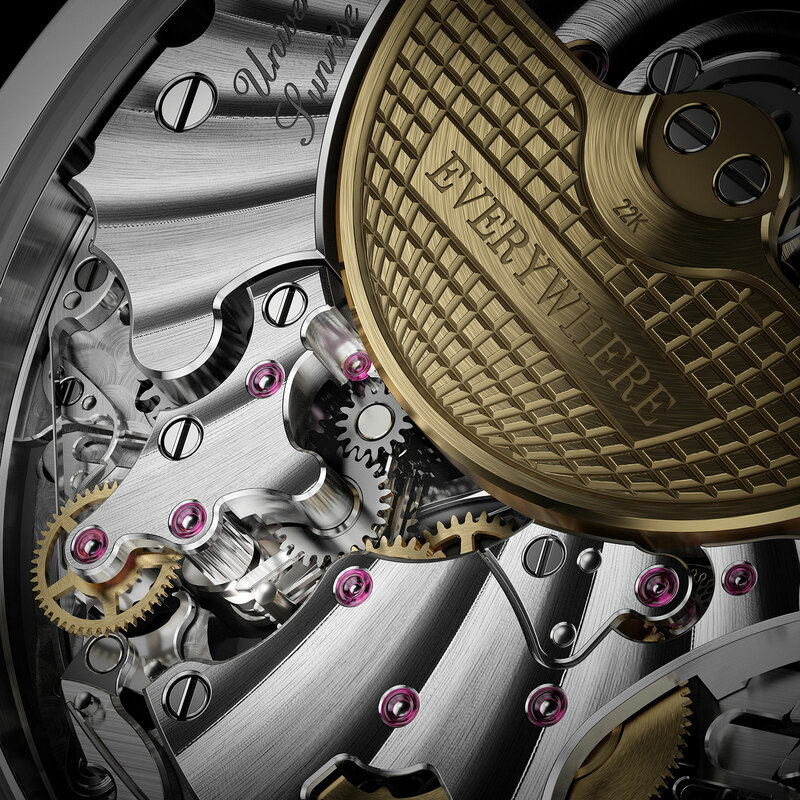 5207, which boasts a tourbillon, minute repeater and instantaneous perpetual calendar. The complexity of the movement lies in its adjustability for any location around the world, making it essentially a complicated mechanical calculator. Because sunrise and sunset times vary across the world, the watch has to be calibrated for the wearer’s position, much like how star chart or equation of time watches are constructed for particular locales. The Everywhere is set in two steps: first the pusher at eight o’clock is used to select the function and then the crown to set it either backwards or forwards. Date, latitude, longitude and time zone have to be set in order to show the correct sunrise and sunset times. 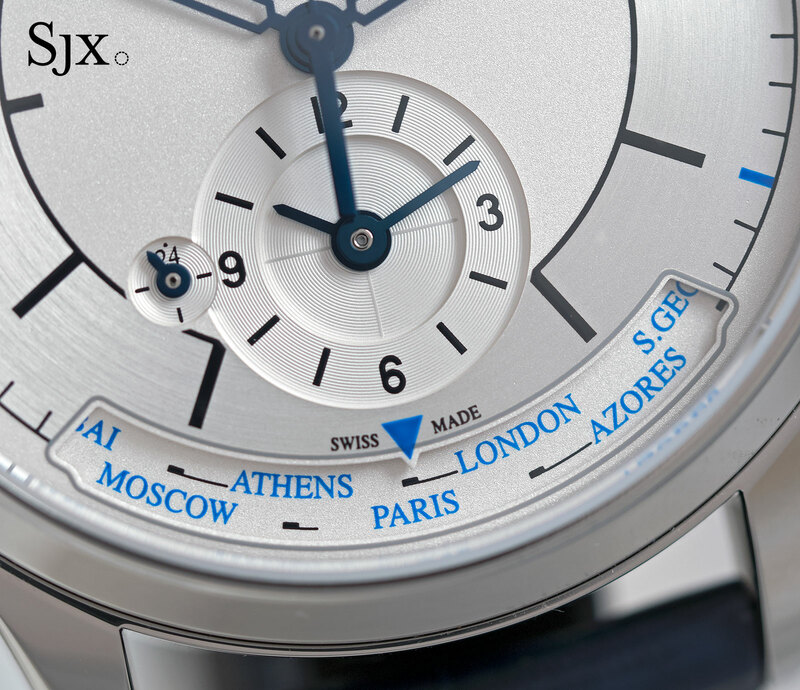 The complex dial requires some explanation: minutes are indicated by a blue central hand while a blue-tipped arrow points to the hours on a 24-hour scale situated on the edge of the dial. 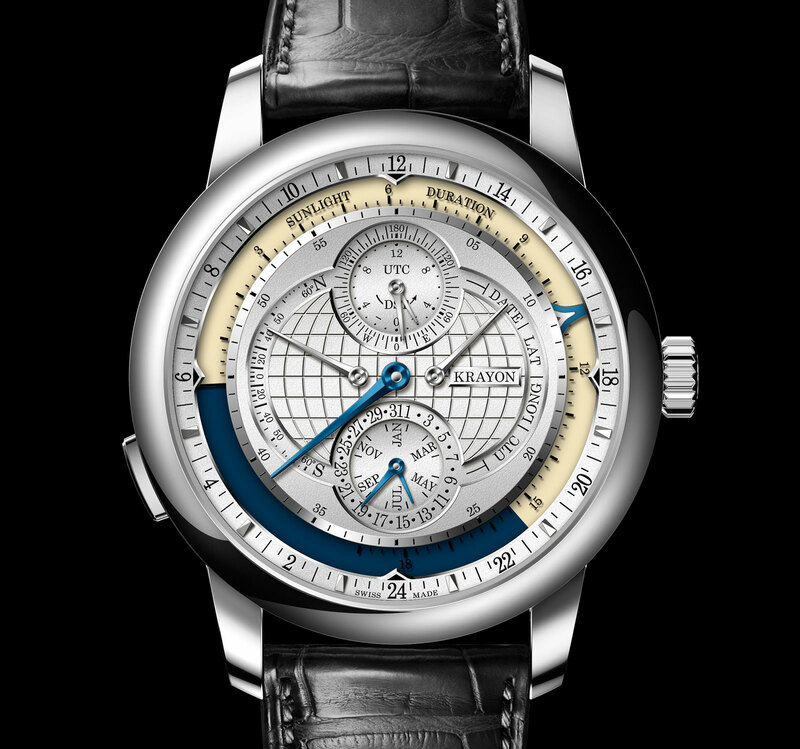 The sub-dial at 12 o’clock indicates longitude and the time zone, which can be set in 30 minute increments, covering practically every time zone around the world. A fan-shaped sub-dial on the left indicates latitude, while the indicator just opposite is the function selector for setting the displays. 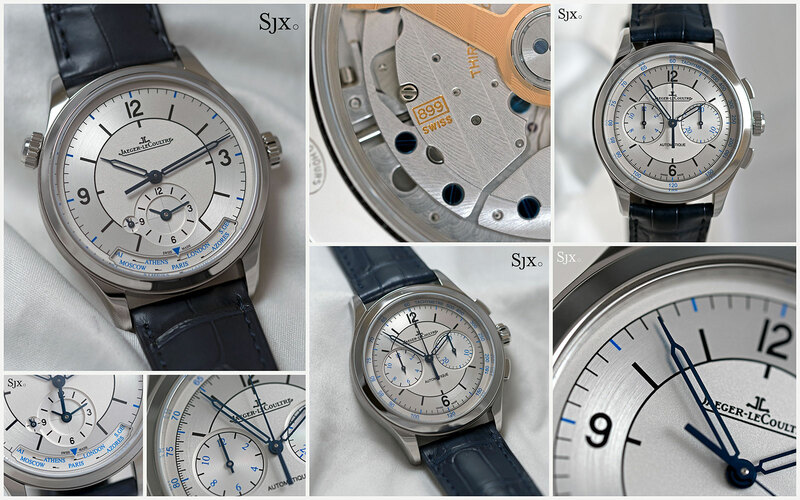 And the sub-dial at six shows the date and month. The movement inside is self-winding with a micro-rotor and 72-hour power reserve, while the case is 42mm wide and 11.7mm high. The Everywhere is a one-off project rather than the first of many, as Krayon will remain a movement constructor working for other brands rather than end consumers. 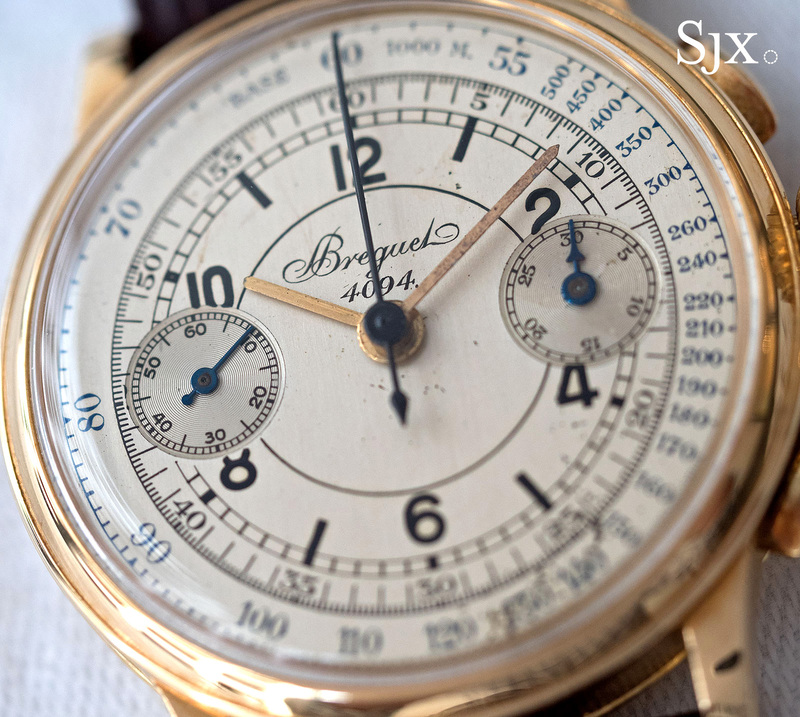 However, Maillat adds that custom-made movements for collectors remain possible. While there is no doubt that the Everywhere is mechanically marvellous and as complicated as advertised, the market conditions mean that the odds are stacked against it. The optimistic it embodies brings to mind the million-dollar, exotic wristwatch unveiled by Dominique Renaud (best known for co-founding Renaud & Papi) last year, which has not been heard from since. Available in white or pink gold and limited to five pieces a year, the Everywhere is priced at SFr600,000, equivalent to about US$615,000. It is available direct from Krayon. A vintage throwback to celebrate the 25th anniversary of the Master Control. Jaeger-LeCoultre is adept with retro remakes, but they have been of the Reverso, until SIHH at the start of the year where the watchmaker unveiled a trio of watches with “sector” dials, a vintage look that’s enjoying its day in the sun right now. 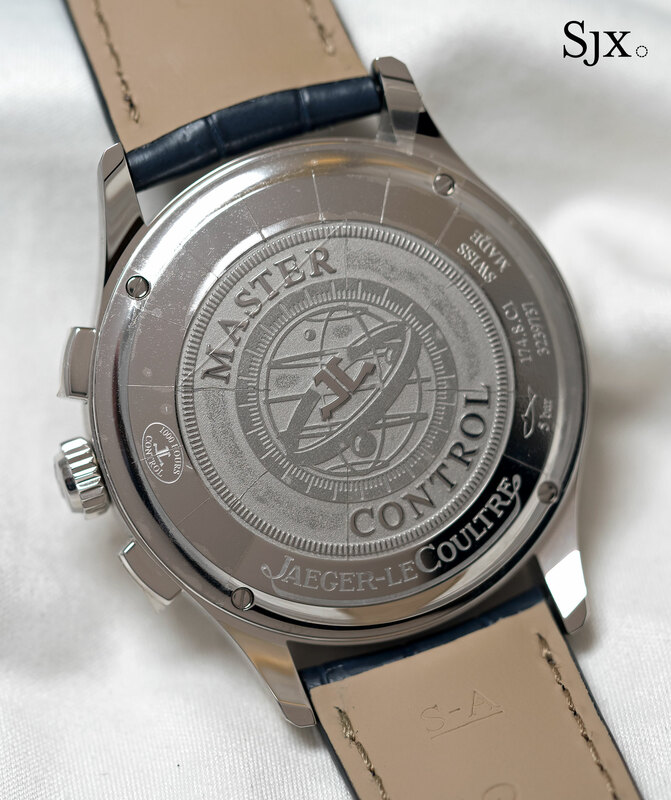 The three watches are to mark the 25th anniversary of the Master Control, a line of watches that got its name from the “1000 hour” test that the watches were subject to. Perhaps a minor exaggeration, the 1000-hour testing nonetheless was a pretty big deal in the 1990s when high-end mechanical watches were still somewhat of a novelty. Now watch testing is standard, which is why the name is known simply as “Master” and perhaps also why the trio of anniversary watches are not tested to 2500 hours, but instead go further back in history for inspiration. The trio of sector dial watches are handsome, easily wearable, and they cost about 10% less than the equivalent Master models without sector dials. It’s hard not to like them. 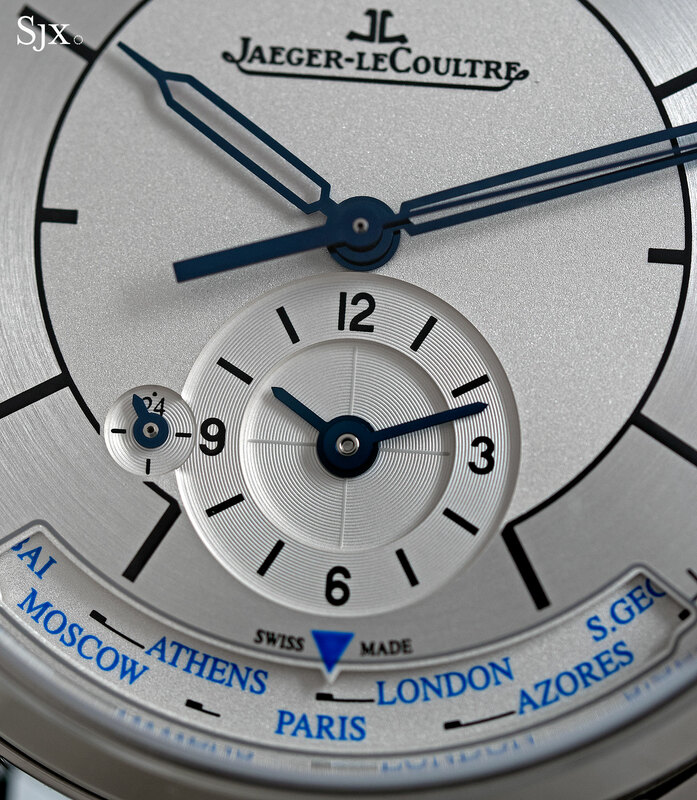 The only quibble is philosophical: the sector dial is not historically associated with Jaeger-LeCoultre. 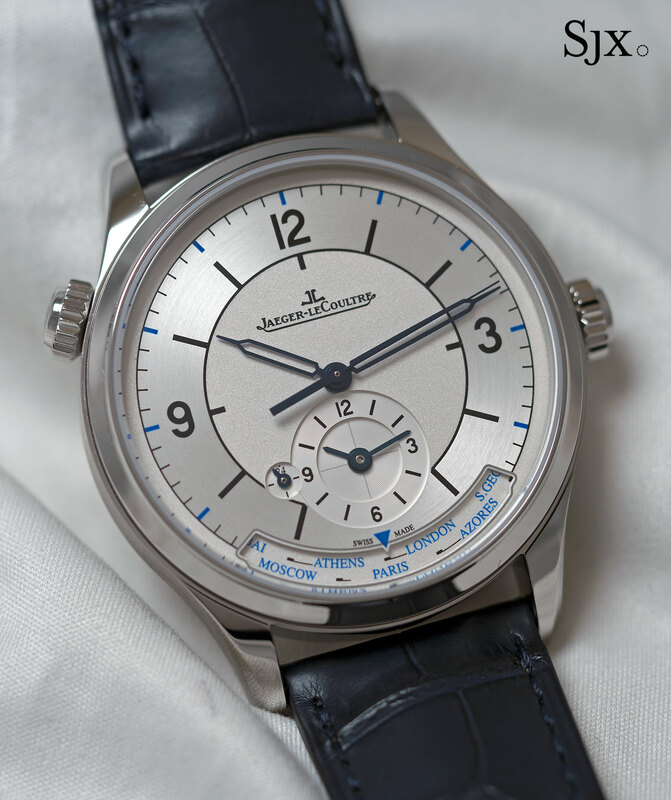 While vintage Patek Philippe, Vacheron Constantin, Longines and other random obscure brands turn up with sector dial watches, Jaeger-LeCoultre does not. 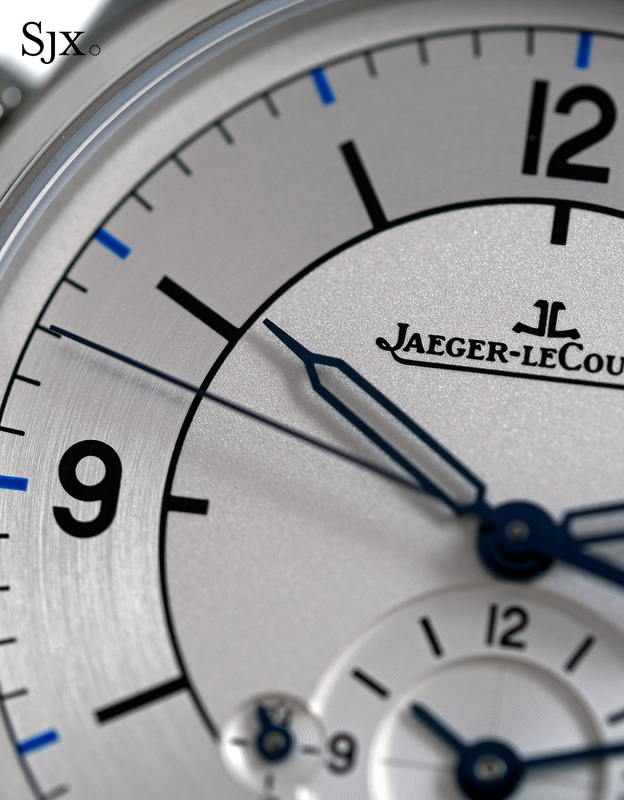 One reason for that is Jaeger-LeCoultre only came into existence in 1937, having been a joint venture between movement maker LeCoultre and Parisian watchmaker and designer Edmond Jaeger before that. 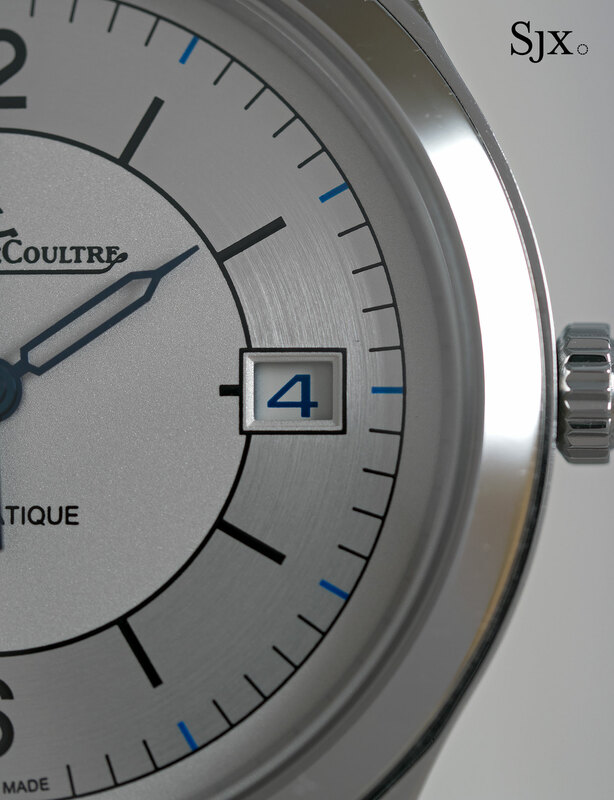 And the other is that Jaeger-LeCoultre (and LeCoultre before that), mainly produced movements for other firms rather than under its own name. Sector dials were popular in the 1930s and 1940s, getting their name from the divisions on the dial that divided it into sectors for hours, minutes and seconds. Also known as “scientific” dials since the divisions ostensibly made time measurement easier, sector dials are a favourite today, found on watches from Laurent Ferrier to Patek Philippe. Their popularity is understandable, given the appealingly functional look that is also distinctly retro. 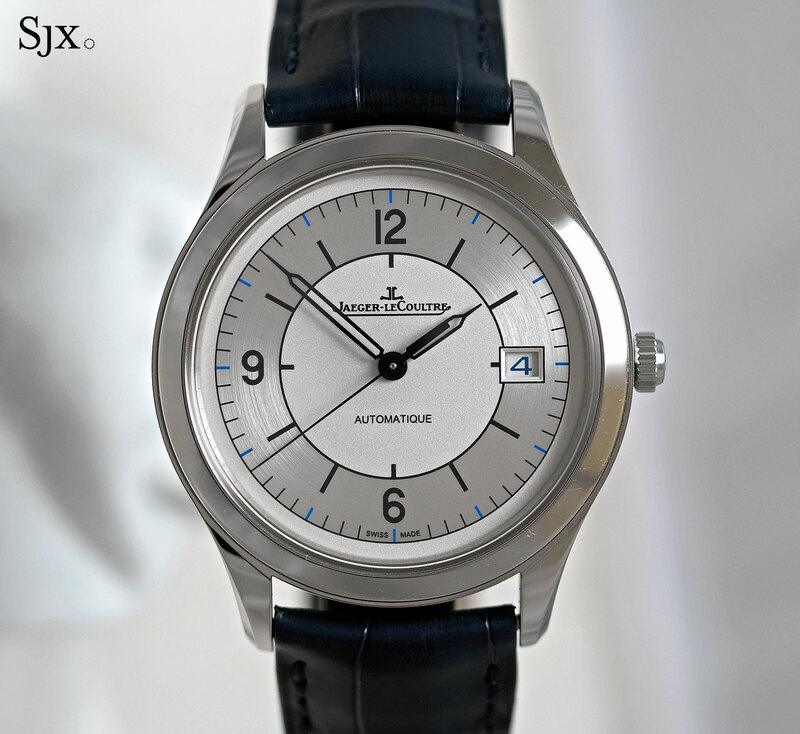 The Jaeger-LeCoultre sector dials possess the look of vintage sector dials, albeit with some modern streamlining. Available on the time-only Master Control Date, dual time zone Master Geographic, or the Master Chronograph, the sector dials are two-tone: grained silver in the centre and outer edge, with a circular brushed chapter ring in between. 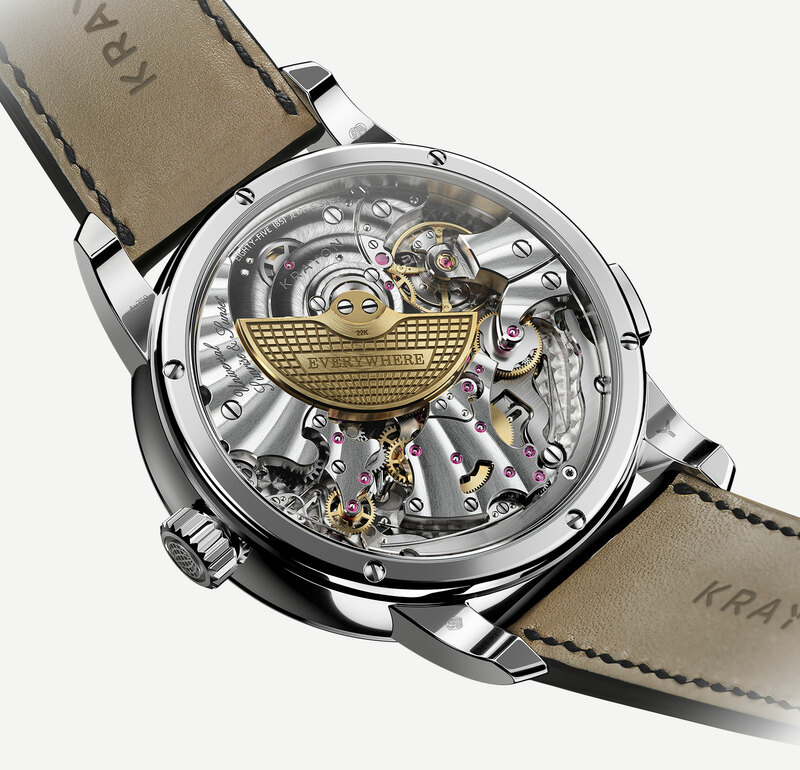 The chapter ring contains both the markers for the hours and minutes, which departs from the traditional sector dial design that separates the two tracks. 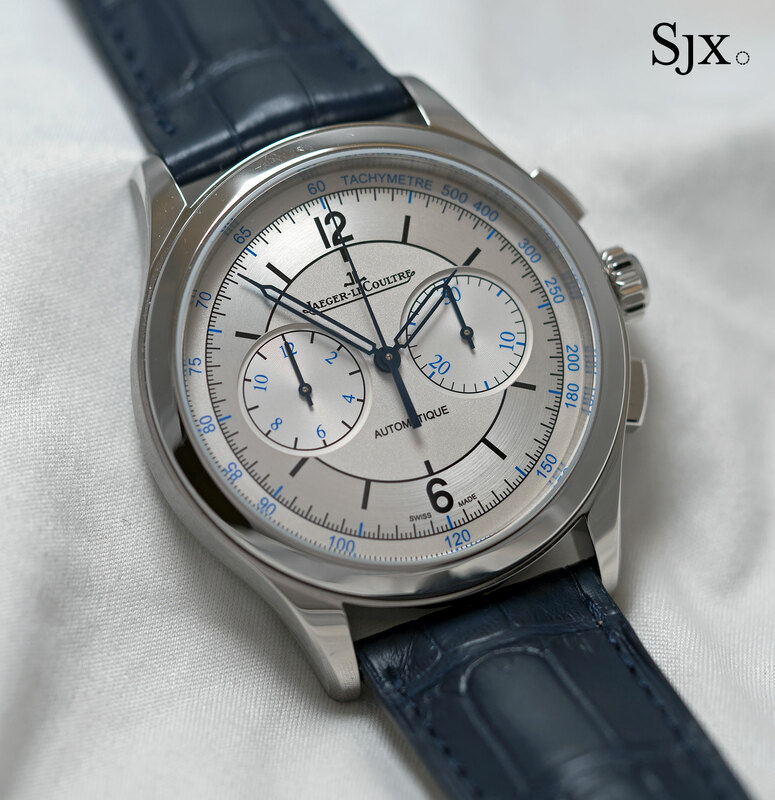 That might not suffice for traditionalists, but will satisfy anyone who wants the feel of a sector dial. Also modern in feel is the printing on the dial is also in two colours, black for most of it with highlights in medium blue. And the hands are syringe-shaped and skeletonised, another element from the 1930s and 1940s (and also found on the retro Patek Philippe ref. 5320G). 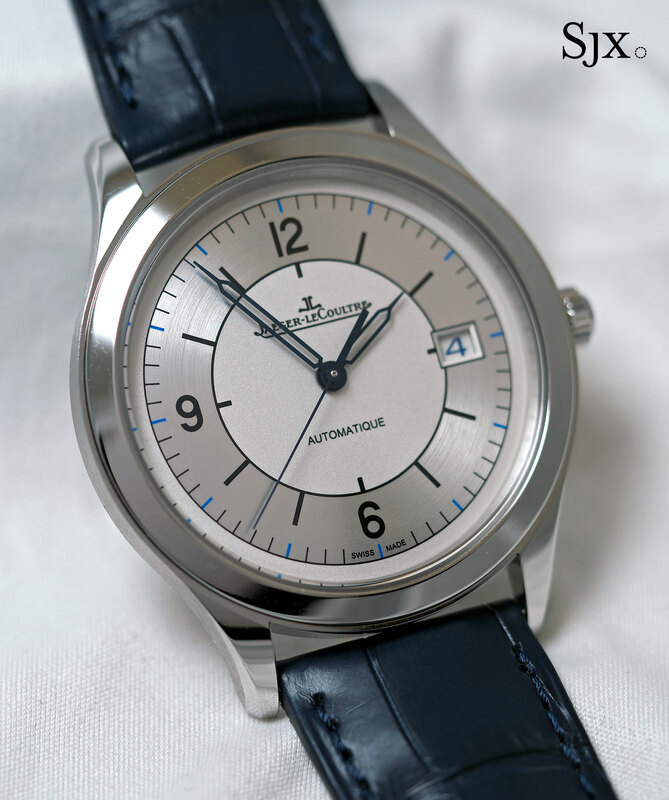 The length of the hour hand (on all three models) is not quite long enough to pass the base of the hour marker, another element that differs from a vintage sector dial. 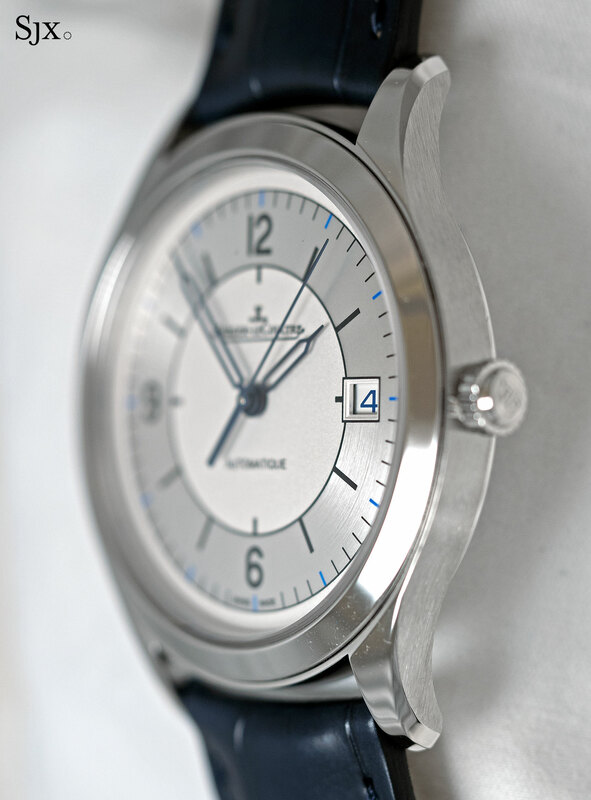 Being entirely printed, the sector dials are far simpler in construction than the conventional Master series dials that has applied hour markers, Super-Luminova, and frames for the date windows. 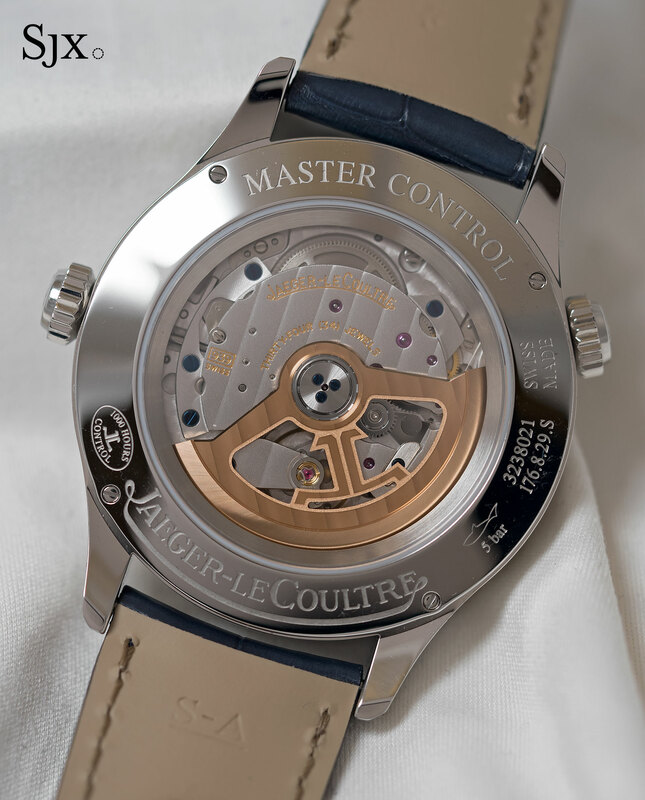 This goes some way to explaining the lower cost compared to the ordinary Master watches. The time-only Master Control Date is arguably the easiest to like. It’s the most straightforward and functional looking, as well as having the smallest price tag. 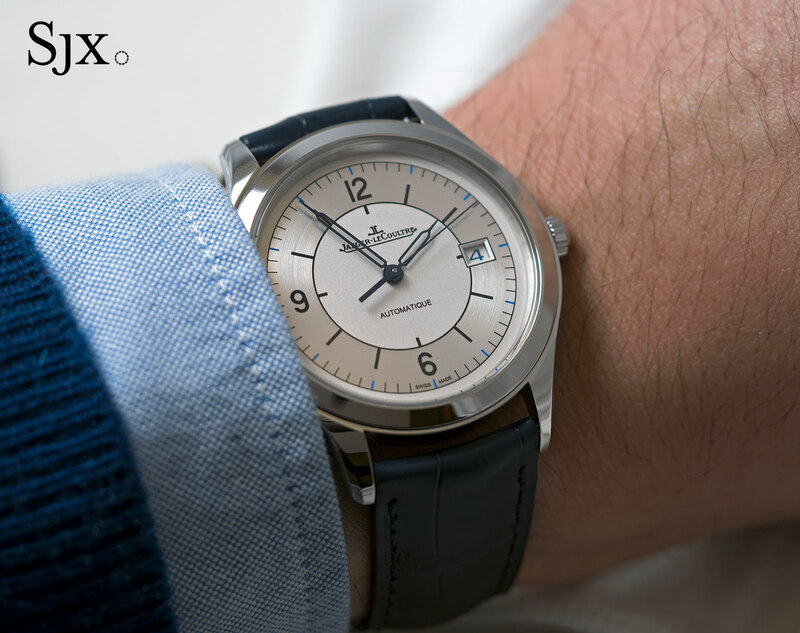 The 39mm steel case is thin at 8.5mm high and easily wearable, cutting an elegant profile on the wrist. It’s finished simply with a mirror-polish on the top and brushing on the sides. The date window is definitely not traditional, but it’s practical and also a fixture on most modern watches so is inescapable. And here the date sits quite well with the dial. Inside is the cal. 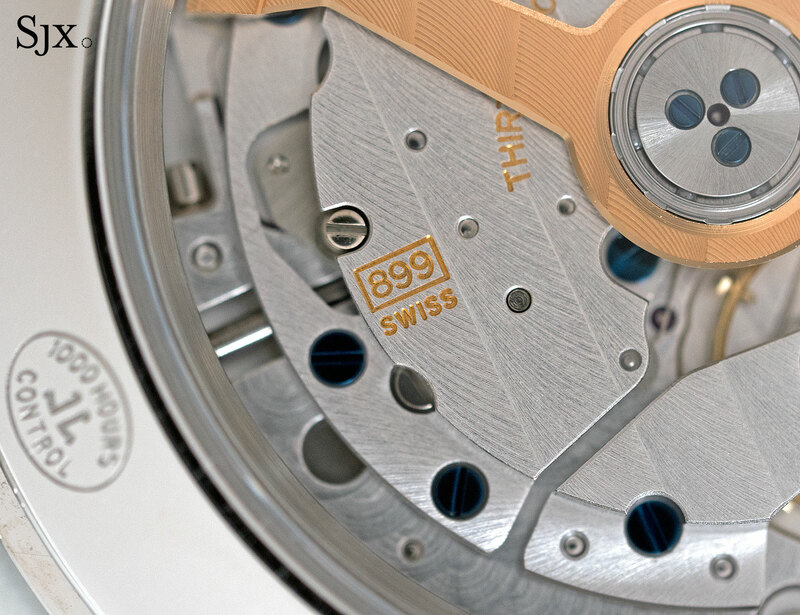 899/1, the basic automatic movement made by Jaeger-LeCoultre. Having evolved from a movement designed in the 1970s, the 899 is compact but suffers from a short 38-hour power reserve. Nonetheless it’s a well-engineered movement that’s been attractively dressed up with blued screws, a gilded rotor and assorted decoration. Up close some elements give it away as a mid-range movement, including the mechanically applied finishing and wire springs, but it looks good through the display back and more importantly, is good quality for the price. 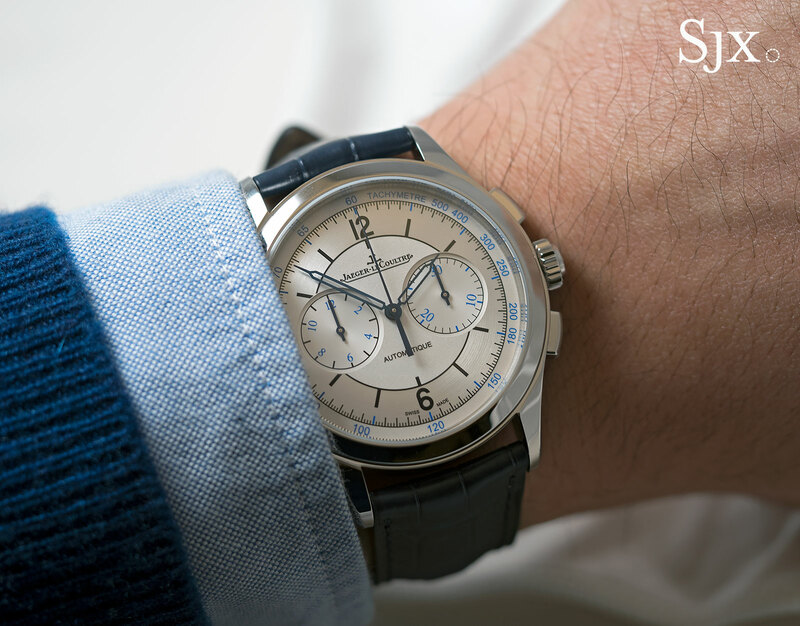 The appeal of the Master Chronograph is similar to the time-only model, being a well-priced and modestly sized watch. But it has a more modern feel, mainly due to the more numerous blue elements on the dial, as well as the large sub-dials. Here the lack of separation between the hour and minute tracks leaves the dial feeling a little cluttered, especially with the tachymeter on the outermost scale. The cal. 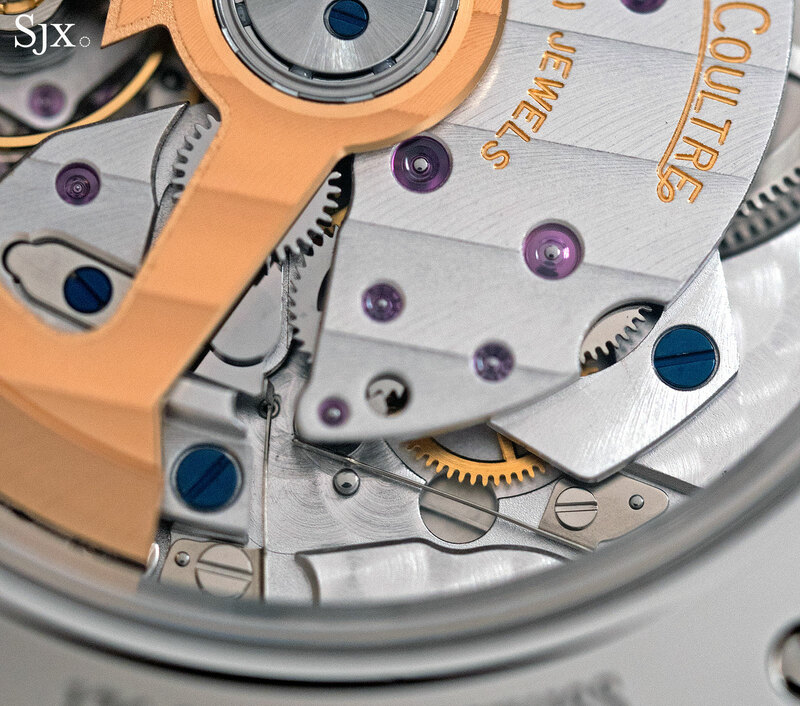 751G inside is hidden beneath a solid case back, but it’s typical of Jaeger-LeCoultre movements – well constructed, compact and to the point. The cal. 751G has all the features expected of a modern chronograph movement in this price range, namely a column wheel and vertical clutch. 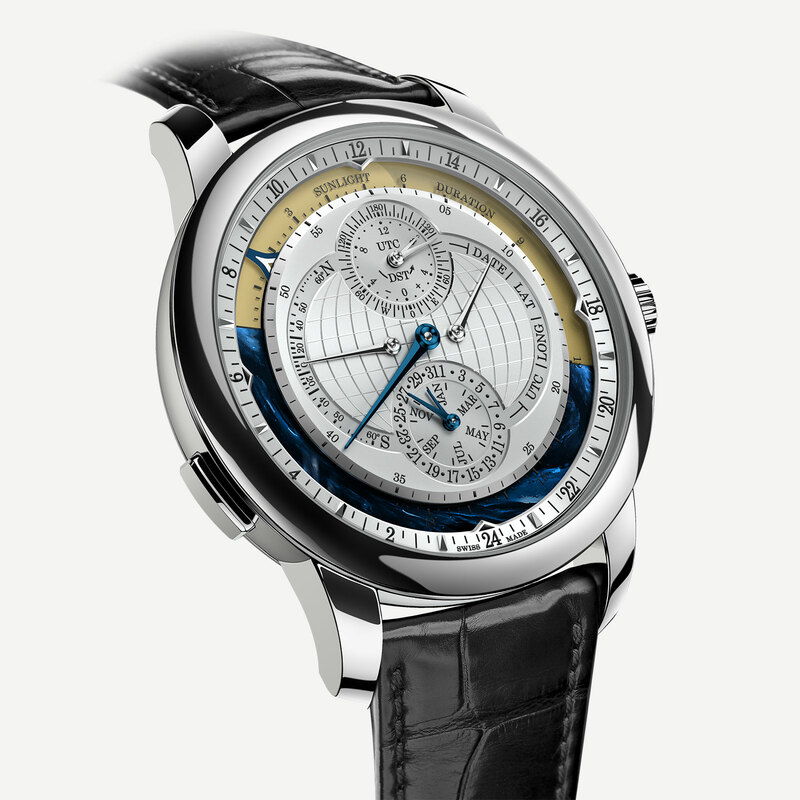 It also has extras of a free-sprung balance and longish 65-hour power reserve. 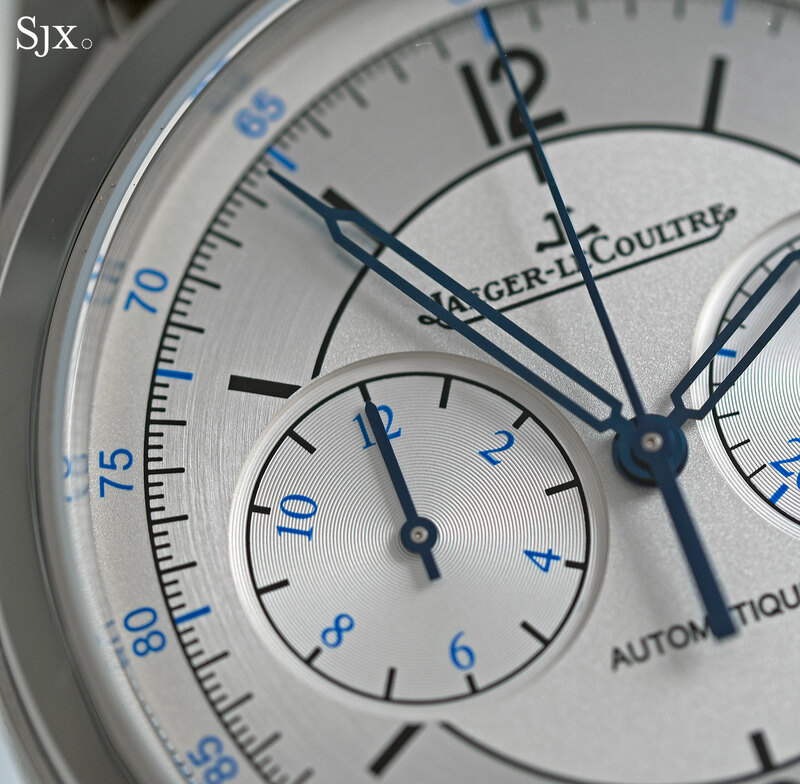 In fact, its construction is similar enough to the chronograph movements from Jaeger-LeCoultre’s sister brands (like Panerai, Montblanc and Cartier), that is is hard to not to conclude that Jaeger-LeCoultre helped out. 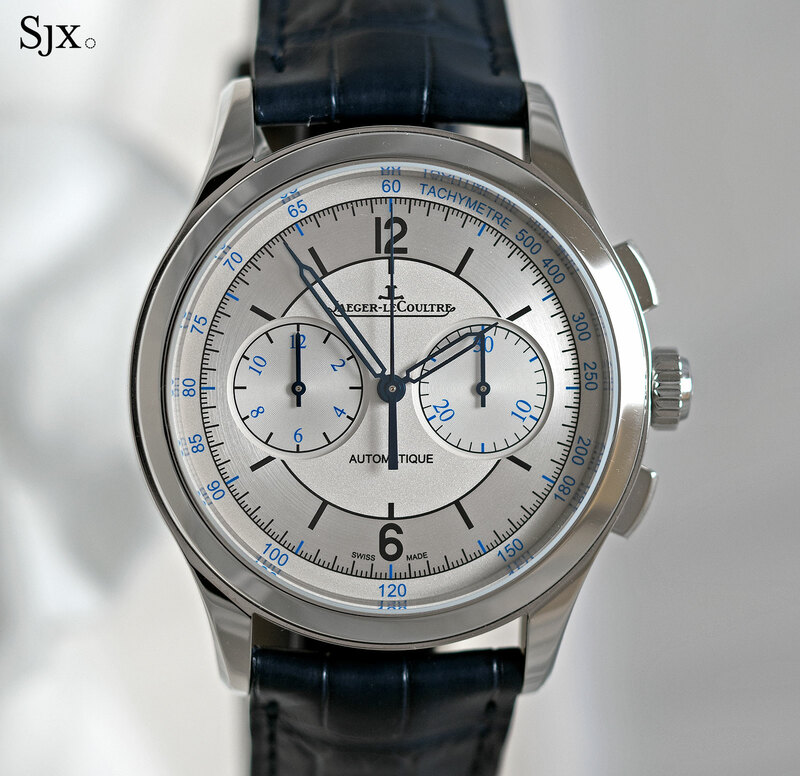 Notably, the sector dial Master Chronograph is a condensed version of the classic Master Chronograph, lacking the date and constant seconds at six o’clock, which helps account for the US$1000 difference in price. 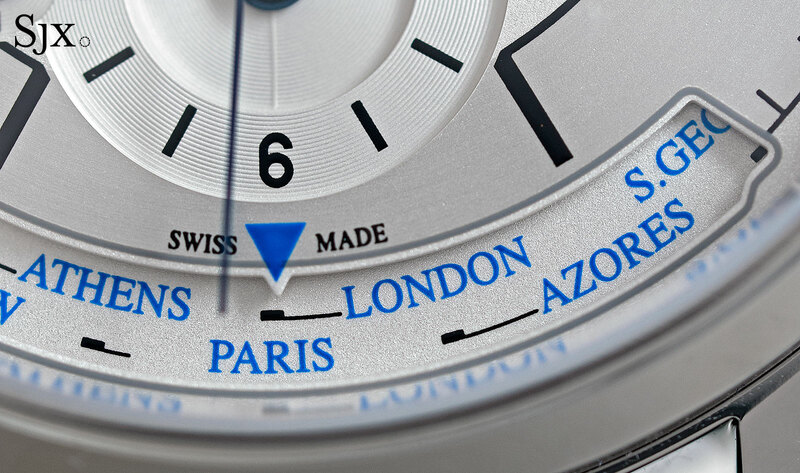 The Master Geographic is the priciest of the three, having the most complicated movement. But like the chronograph it has been simplified, having only the second time zone, day and night display, and cities disc. 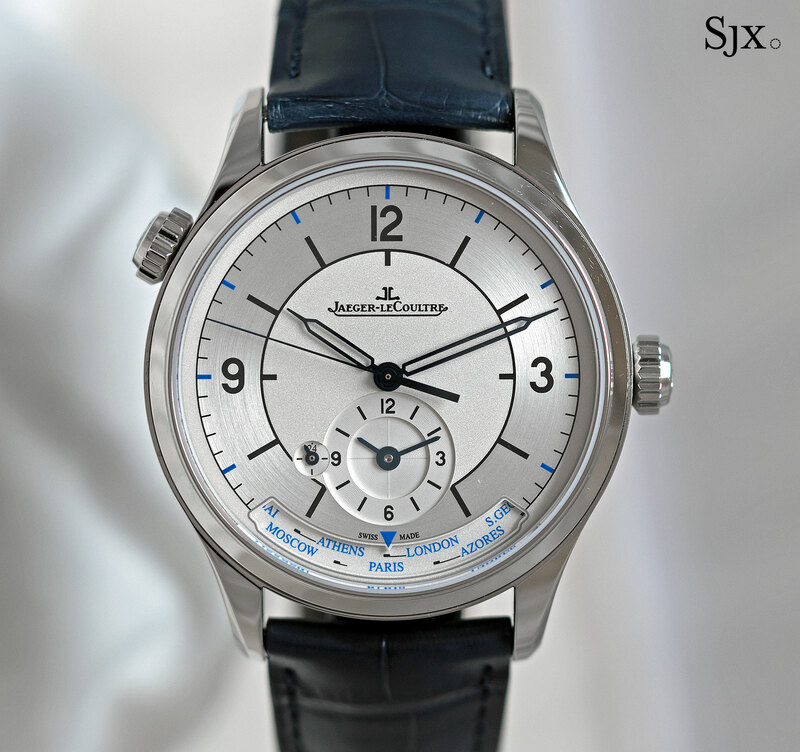 The date and power reserve indicator found on the full spec model are absent, hence the price being US$1400 lower for the sector dial model. The sub-dial at six o’clock indicates the second time zone, with the cities disc below to switch the second time zone display. Functionally it’s intuitive, with the crown at 10 o’clock to deal with the second time zone. 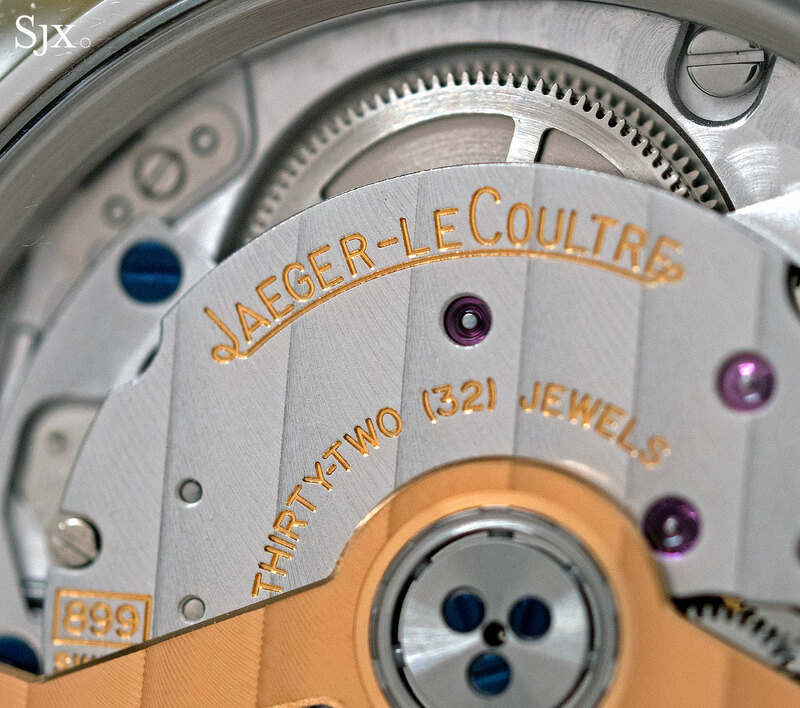 The back reveals the movement, which is typical of Jaeger-LeCoultre movements, having the same style as the cal. 899 inside the Master Date. It is automatic with a 43-hour power reserve. The Master Control Date (ref. 1548530) costs US$5700 or S$8800. 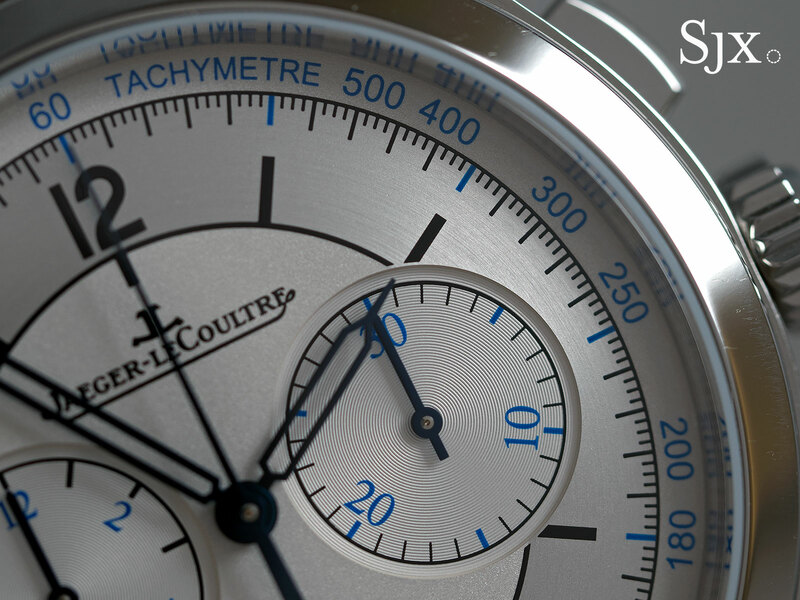 The Master Chronograph (ref. 1538530) is priced at US$8000 or S$12,400. And the Master Geographic (ref. 1428530) retails for US$9400, or S$14,600. All three are priced at about 10% less than comparable Master Control watches of the earlier generation. None are numbered limited editions, but are “limited production”. 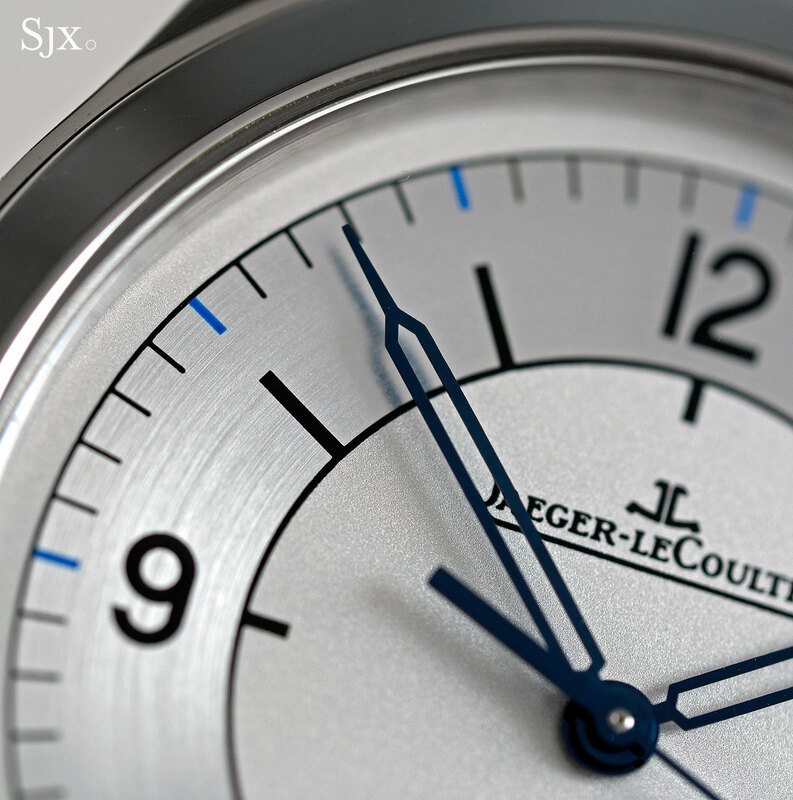 They will be available at Jaeger-LeCoultre boutiques and retailers starting June 2017.